Rock & Roll Rip-Off is written as a semi-inverted whodunit, with the crime taking place -- and the identities of the culprits given -- during the first six chapters, though not everything is known to the reader." > Rock & Roll Rip-Off by R. J. McDonnell, a Mysterious Review. 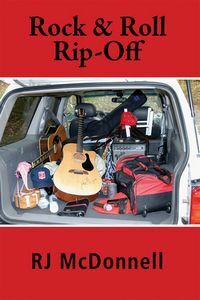 Review: Former band musician Jason Duffy, now a private investigator in San Diego, looks into the theft of a multi-million dollar collection of rock-and-roll memorabilia in Rock & Roll Rip-Off, the second mystery in this series by R. J. McDonnell. Max Varner is a career studio keyboard musician who provides a professional presence, and often sage advice, to new bands. During his twenty-some-odd years of working with groups, he has amassed a large, unique collection of souvenirs. "While most people collect autographs and autographed guitars," he tells Jason, "I collect off-beat stuff like chipped symbols, old wah-wah pedals, stage-worn costumes, hair extensions, and things like that." But that collection, recently appraised for $2.7 million, has now been stolen. Due to the uniqueness of the items, which are likely to be impossible to fence locally, Max fears the collection will be shipped to Mexico and broken into small lots, to be sold overseas. He hires Duffy to prevent that from happening. Duffy's task seems overwhelming: the suspect list includes over 200 guests that recently attended a party at Max's house. But soon after he begins his investigation, he discovers that some serious men with some serious weapons are covering up more than just a simple theft. Rock & Roll Rip-Off is written as a semi-inverted whodunit, with the crime taking place — and the identities of the culprits given — during the first six (very short) chapters, though not everything is known to the reader. Subsequently, Duffy's participation is more along the lines of a procedural, though there are passages within some chapters from the perspective of the thieves. This approach doesn't work quite as well as it should, especially since it's clear early on that the author intends to unveil a twist in the end. Still, the plot is well considered and developed, and Jason Duffy an appealing PI. A musician himself, the author clearly knows the world in which he sets his mysteries, providing an insider look at not only what the public sees on stage, but also what it takes behind-the-scenes to get it there. Finally, the rocky relationship Duffy has with his father, introduced in the first book of the series, takes a step forward here … a nice touch. Acknowledgment: the author provided a copy of Rock & Roll Rip-Off for this review.